2019 arrived with stealth in our household. We celebrated new year’s eve with an even earlier night than expected since we’d all picked up a cold and were feeling sorry for ourselves. I heard the fireworks at midnight thanks to Art getting the munchies, but otherwise it passed without drama. Thankfully, we’ve had little drama with Corey either so far, which is exactly how I like early pre-season training to go. He’s done all of his walking and started schooling in the field, including having a couple of little jumps and his first interval training. I can feel how much he wants to go belting round as fast as possible – if he could shout ”wheeee” you’d hear it in the next county – but he has been trying his absolute utmost to stay calm and steady. He has almost remembered how to put his energy and enthusiasm into sitting behind, and is making a good attempt at what must be hard work after his break. Mum is taking on her role of chief training planner with her usual gusto and analytical approach, setting up all sorts of polework exercises inspired by a Caroline Moore demo we attended for her birthday (next year I’m buying her some socks). We’re gearing up to start him at Lincoln in mid-March, with a view to entering the international at Chatsworth. It’s a daunting prospect but after Nicki’s excellent work last year I know Corey is well up for the challenge and as Tracee Ellis Ross says “I am learning everyday to allow the space between where I am and where I want to be inspire me and not terrify me”. So I’m going to stop being scared that I might not be a good enough rider and focus on making sure I become a good enough rider. 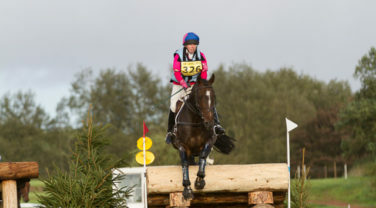 I was very proud of the way I rode at the end of the year – double clear at Kelsall and then a good effort in the riding club 1.20m combined training (winning the class but only by virtue of being the only ones in it again!). I’ve come out of the winter a bit rusty, but knowing I’ve done it once means knowing I can do it again. I’ve even got my tailcoat ready! Last year I had an extra obstacle to overcome and whilst I’m still battling it I hope it will be defeated this year. Ever since I had Floss nearly four years ago, I’ve not been shy about expressing my view of motherhood – which is to say that I find it tough and not always as rewarding as I’d expected it to be. It took me a long time to bond with her and come to terms with being a Mum. This time around I bonded with Art almost immediately, and felt like I was going to boss being a Mum. A few weeks later, I felt the complete opposite. I wasn’t coping, I had lost my bond again, and I felt lost and helpless. Thankfully my health visitor could see that it was more than just new baby exhaustion (though that certainly didn’t help) and referred me to get help for post-natal depression. I had fantastic support from everyone – including the NHS and a local support charity called Smile – but especially from Al and my family who recognised that as tired as I was, getting out on Corey was more important to my mental health than taking a nap. I have joked about It for years but it quite literally kept me sane. I spent most of the summer in a bit of a fog, with even the best of days eventing feeling like there was a cloud hanging over them. On top of that I had a lot of anxiety, and felt terribly conflicted and guilty about the fact that to do pretty much anything required someone else to look after the children. I couldn’t even feel ok about Al looking after them so I could take a shower. Making even simple decisions was such a strain on my sleep-deprived brain that I missed out on several opportunities. I was back in the saddle but I didn’t have many lessons because the idea of trying to schedule them in around Floss and Art seemed so complicated that I often couldn’t even try. 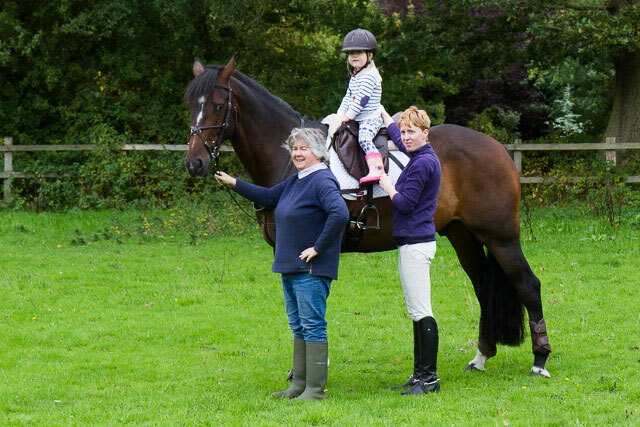 One particular day I remember, I planned to go show jumping with the riding club. It is all entries on the day so there are no times in advance and it is a skill in itself trying to gauge when to arrive. Trying to calculate that, fit it around Art’s lunch, Floss’s lunch, everything else… it was too much. I could feel my brain shutting down and couldn’t face the idea of trying to jump in public. I literally went and cried in bed (much to Floss’s bemusement). In the end Al helped me muster the energy to get out the house to see Corey, Mum helped me have a little no pressure jump in the field and Floss had a sit on Corey too. The day ended on a comparative high but it was bittersweet knowing that I missed the fun of jumping with my friends. However, although I hope I’ve still got more recovery to make and that my current state of mind isn’t my final state of mind, I’m optimistic about 2019: I’ve already managed to have three lessons (high five to me! ), I have gained a lot of skills from CBT sessions that I can use to straighten my head out both on and off a horse; Art occasionally sleeps through an entire night (rarely, but at least we know he’s trying out the idea); Floss is showing a distinct interest in horses, mostly asking when she can start jumping Corey; and I’m already riding with a confidence and focus that puts me in good stead for achieving my goals. So I’m starting the year with no particular resolutions except ‘be kind to yourself’, because even that is still harder than it should be some days. And I have a few goals for what I want to achieve with Corey this year. Two points in a day, complete an international, double clear at newcomers, and establish (or maybe just start learning) flying changes. None of them terrifying, all of them inspiring me to try. We’ve had a fantastic summer with Corey, so to some extent there was no pressure for the rest of the season. Except that I wanted to do a little bit more eventing for myself before the winter set in.